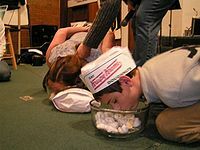 For those without comedic tastes, the so-called experts at Wikipedia have an article about Krispy Kreme. McFuckles was hoping that the President at the time would eat one, but John. F. Kennedy didn't. Now he wants George Bush to eat one, so that then the Vike President will bekome President. 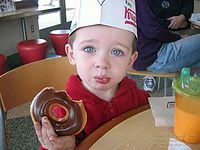 Then he will kill the Vice President with his deadly Krispy Kreme weapon, after somehow bekoming the new Vike President. Then Gaylord McFuckles will kontrol the most powerful nation in the world, the United States of Amerika. Then he will use Amerika's weapons and military to konquer the world.